Our Parish Church Community Room is new! 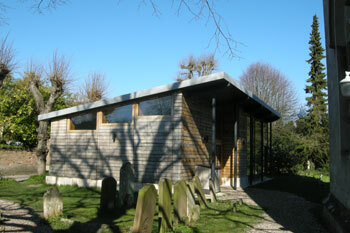 It is a well cherished single storey building, designed as a meeting room and has wheelchair access. It is sited in the churchyard between the Church and the school. 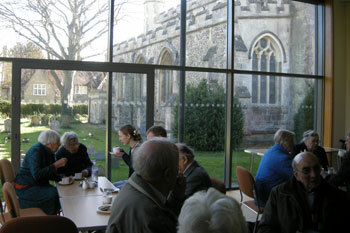 The Room was formally opened by the Bishop of Ely in June 2012. The room is becoming well used by the groups within the church and village communities and also the School Breakfast Club. The formation of a Mother and Toddler Group is well under way. The PCC welcomes the hiring of the Community Room by other local organisations and individuals. Primarily, it is a meeting room with seating for up to forty, has good cloakroom facilities and a small servery. We offer a warm room, comfortable chairs and small tables. The servery is well equipped for serving hot drinks and finger refreshments. However, the Hall will not be suitable for all occasions, hence prospective hirers will need to check their needs with our Hall administrators.